I had these scanned and ready to post seven or eight months ago at least. They kept getting shoved to the back burner, and only when I got an email from someone who saw a reference I had made to them was I finally prompted to actually get them organized and posted here. The folder is HERE in the GALLERY. A SUBFOLDER has the images without the text. I will link to some images soon as I get the time. 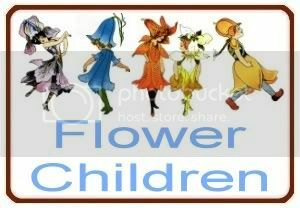 The Flower Children Store is a shop where you can purchase many items with these images. I will soon add images linking directly to the Gallery. Thank you so much for these gorgeous and fun images. I have the original book series. It is nice to see it is still appreciated. John: Hi. I’m looking for a series of books by William Donahey copyrighted in 1921, or so called “The Teenie Weenies” For Ex: “Down the River with the Teenie Weenies” (I have this one and one other, “”The Teenie Weenies Under the Rosebush.” I suspect there are more. I’d especially like the first one if you can find it.